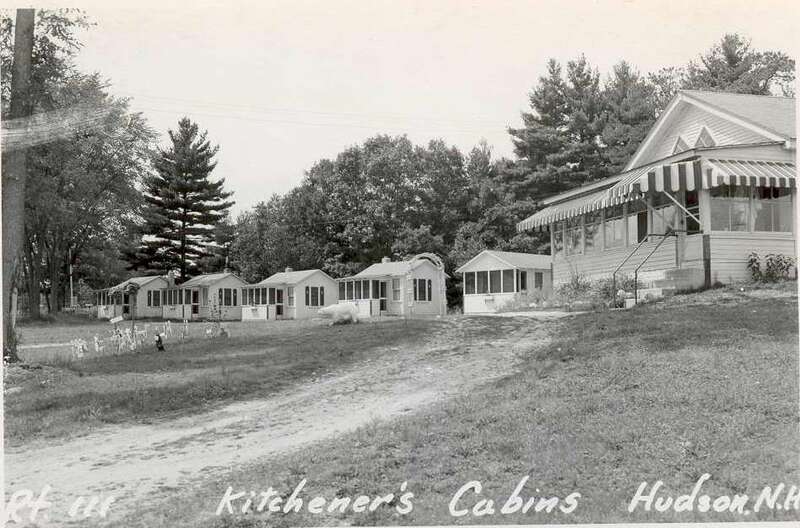 In 1955 Kitchener’s Cabins on Route 111 in Hudson advertised as follows: one-half mile from Benson’s Wild Animal Farm, heated cabins, radios, showers, continuous hot water, fishing and boating on premises, novelties, souvenirs, and swimming at Ottarnic Lake!! Arthur Kitchener, a Hudson resident, received a permit from the Town in 1947 to build a set of 4 cabins on land along Ferry Street near Tarnic Pond; an 8 acre parcel and a portion of the land once owned by the Balcom Ice Co.This ice house, the largest wooded house in the state, was completely destroyed by fire in November 1945. When Kitchener received the permit, it was the first such permit granted by the town. A few years later he expanded the number of cabins. By 1956 his wife Jennie Kitchener operated the cabins; still later their daughter Constance (Kitchener) Durwin owned and operated the business. .
As times and business needs changed these cabins and the surrounding property morphed into a mobile home park and an automotive repair and sales business. In 1980 it became the site of Champion Motors owned by Lenny “Mac” McCallum and the adjacent Kitchener’s Mobile Home Court was owned by Constance. Located at what is now 120 – 122 Ferry Street, opposite the Dairy Queen, this site is now the locatiom of Granite State Auto and Otarnic Pond Cooperative. Photo from the Historical Society Collection. By Ruth M Parker in Ferry on April 2, 2015 .